Google’s big move into ethics-theatre backfires. Given that the tech giants, which have been ethics-free zones from their foundations, owe their spectacular growth partly to the fact that they have, to date, been entirely untroubled either by legal regulation or scruples about exploiting taxation loopholes, this Damascene conversion is surely something to be welcomed, is it not? Ethics, after all, is concerned with the moral principles that affect how individuals make decisions and how they lead their lives. That charitable thought is unlikely to survive even a cursory inspection of what is actually going on here. In an admirable dissection of the fourth of Google’s “principles” (“Be accountable to people”), for example, Prof David Watts reveals that, like almost all of these principles, it has the epistemological status of pocket lint or those exhortations to be kind to others one finds on evangelical websites. Does it mean accountable to “people” in general? Or just to Google’s people? Or to someone else’s people (like an independent regulator)? Answer comes there none from the code. Postscript: Since this column was written, Google has announced that it is disbanding its ethics advisory council – the likely explanation is that the body collapsed under the weight of its own manifest absurdity. That still leaves the cynical absurdity of Google’s AI ‘principles’ to be addressed, though. What makes a ‘tech’ company? The Blackrock Blog points out that something strange is going on in the investment world. MSCI and S&P are updating their Global Industry Classification Standards (GICS), a framework developed in 1999, to reflect major changes to the global economy and capital markets, particularly in technology. Take Google, a company long synonymous with “tech” and internet software. Google parent Alphabet derives the bulk of its revenue from advertising, but also makes money from apps and hardware, and operates side ventures including Waymo, a unit that makes self-driving cars. Decisions about what makes a “tech” giant are not as simple as they once were. The sector classification overhaul, set in motion last year, will begin in September and affect three of the 11 sector classifications that divide the global stock market. A newly created Communications Services sector will replace a grouping that is currently called Telecommunications Services. The new group will be populated by legacy Telecom stocks, as well as certain stocks from the Information Technology and Consumer Discretionary categories. Facebook and Alphabet will move from Information Technology to Communications Services in GICS-tracking indexes. 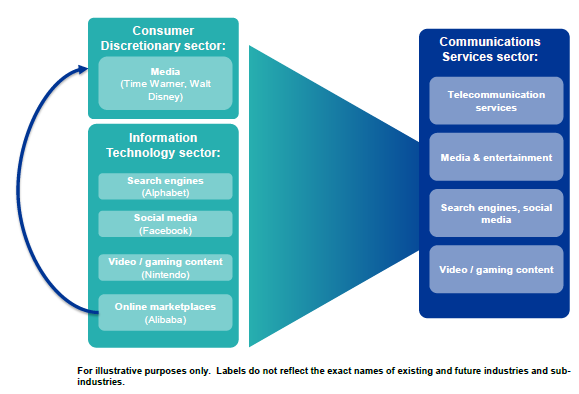 Meanwhile, Netflix will move from Consumer Discretionary to Communications Services. None of what the media has dubbed the FANG stocks (Facebook, Amazon.com, Netflix and Google parent Alphabet) will be classified as Information Technology after the GICS changes, perhaps a surprise to those who think of internet innovation as “tech.” The same applies to China’s BAT stocks (Baidu, Alibaba Group and Tencent). All of these were Information Technology stocks before the changes; none will be after. This change is probably only significant for index funds, but still, it must rather dent the self-image of the ‘tech’ boys to be categorised as merely “communications services”! Spool forward to the tragic case of Molly Russell, the 14-year-old who killed herself after exploring her depression on Instagram. When her family looked into her account, they found sombre material about depression and suicide. Her father said that he believed the Facebook-owned platform had “helped kill my daughter”. This prompted Matt Hancock, the health secretary, to warn social media platforms to “purge” material relating to self-harm and suicide or face legislation that would compel them to do so. In response, Instagram and Pinterest (another social media outfit) issued the standard bromides about how they were embarking on a “full review” of their policies etc. INTERNET GIANT Google now pays more in European fines than it does in taxes, the firm’s fourth-quarter earnings have revealed. Google owner Alphabet company reported Q4 revenues up 22 per cent to $39.28bn, while annual revenues were up 23 per cent to $136.8bn. The company also took the time to separate out “European Commission fines” in its consolidated statements of income in the company’s accounts. These increased from $2.7bn in 2017 to $5.1bn in 2018, with a further €50m already set to be added to the bill for its first quarter and 2019 accounts, thanks to French data protection authority CNIL. That compares to a provision for income taxes of just $4.2 billion for 2018, or 12 per cent of its pre-tax income. 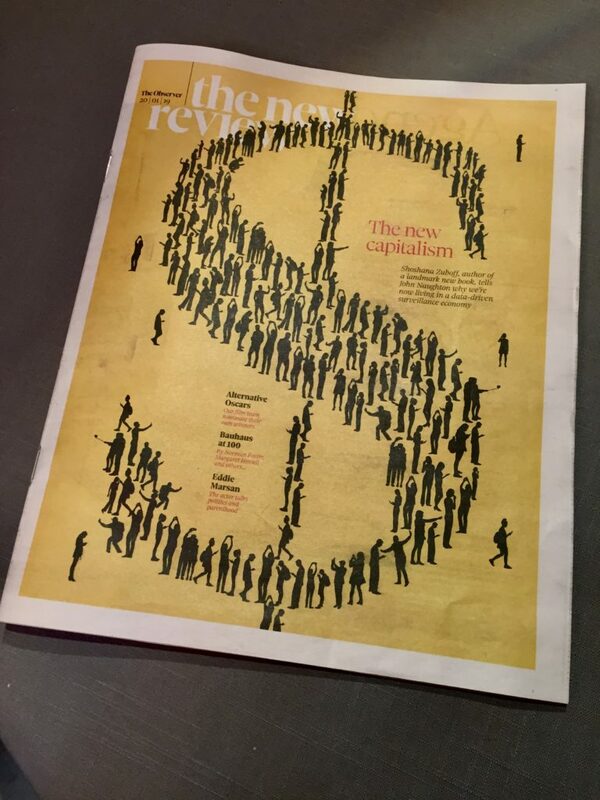 Today’s Observer carries a five-page feature about Shoshana Zuboff’s The Age of Surveillance Capitalism consisting of an intro by me followed by Q&A between me and the author. LATER Nick Carr has a perceptive review of the book in the LA Review of Books. John Thornhill also had a good long review in last Saturday’s Financial Times, sadly behind a paywall. The Register has a rather good report of the two investigations carried out for the Senate Intelligence Committee — and it highlights something that other reports seem to have missed — how the social media giants did their best to be, er, unhelpful. The second Senate-commissioned report, written by Oxford University’s Internet Institute, reached the same conclusion: that the Russian campaign was large, sophisticated, and focused on Donald Trump’s election as president. In this report, however, researchers also take time to criticize the response of the social networking giants to their efforts to understand what had happened: the internet titans were extremely unhelpful, even after being publicly chastised in the press and in Congress. The worst offender may have been Google, which supplied very little information and when it did, supplied in it hard-to-search PDFs, making it difficult and time-consuming to analyze. Facebook was no better: simply refusing to hand over information and limiting what it did send to English-language pages. Even the most responsive company – Twitter – only sent the researchers shortlinks, as opposed to full URLs, making it harder to use other tools to track their impact and links across the internet. The New Knowledge report says the same, noting that the companies also appear to have stripped meta data from the information they sent i.e. they actively tried to disrupt efforts to understand the reach and impact of Russian propaganda efforts. In short, the two reports tell us what we already knew: that there was a large, organized Russian campaign in favor of Donald Trump; that the campaign used divisive social issues to attract people’s attention and push its messages; and the tech companies were caught completely unawares and then responded incredibly defensively when the size and scope of the propaganda campaign was revealed. The difference from previous dossiers is that these reports are comprehensive and detailed. And they clearly identify the strategies and targets where previously much of the detail was anecdotal or intelligent conjecture. And, of course, we learned that Instagram punches above its weight, and the Russian campaign was so well resourced that it even bothered to post on Google+. If antitrust is due for a revival, just what should the antitrust law be doing? What are its most obvious targets? Compiled here (in alphabetical order) , and based on discussions with other antitrust experts, is a collection of the law’s most wanted — the firms or industries that are ripe for investigation. Investigation questions: Does Amazon have buying power in the employee markets in some areas of the country? Does it have market power? Is it improperly favoring its own products over marketplace competitors? Investigation question: In light of this, was the trial court’s approval of the AT&T and Time Warner merger clearly in error? Over the last five years, the agricultural seed, fertilizer, and chemical industry has consolidated into four global giants: BASF, Bayer, DowDuPont, and ChemChina. According to the U.S. Department of Agriculture, seed prices have tripled since the 1990s, and since the mergers, fertilizer prices are up as well. Investigation question: Were these mergers wrongly approved in the United States and Europe? The pharmaceutical industry has a long track record of anticompetitive and extortionary practices, including the abuse of patent rights for anticompetitive purposes and various forms of price gouging. Investigation and legislative questions: Are there abuses of the patent system that are still ripe for investigation? Can something be done about pharmaceutical price gouging on drugs that are out of patent or, perhaps more broadly, the extortionate increases in the prices of prescription drugs? Having acquired competitors Instagram and WhatsApp in the 2010s in mergers that were arguably illegal, it has repeatedly increased its advertising load, incurred repeat violations of privacy laws, and failed to secure its networks against foreign manipulation while also dealing suspicious blows to competitor Snapchat. No obvious inefficiencies attend its dissolution. Investigation questions: Should the Instagram and WhatsApp mergers be retroactively dissolved (effectively breaking up the company)? Did Facebook use its market power and control of Instagram and Instagram Stories to illegally diminish Snapchat from 2016–2018? Investigation question: Has Google anticompetitively excluded its rivals? Investigation questions: Has Live Nation used its power as a promoter to protect Ticketmaster’s monopoly on sales? Was Songkick the victim of an illegal exclusion campaign? Should the Ticketmaster/Live Nation union be dissolved? Investigation question: Would the merger between T-Mobile and Sprint likely yield higher prices and easier coordination among the three remaining firms? The U.S. airline industry is the exemplar of failed merger review. Investigation and regulatory questions: Should one or more of the major mergers be reconsidered in light of new evidence? Alternatively, given the return to previous levels of concentration, should firmer regulation be imposed, including baggage and change-fee caps, minimum seat sizes, and other measures? Legislative question: Should Congress or the states impose higher levels of scrutiny for health care and hospital mergers? ype “What is the future of search?” into Google and in 0.47 seconds the search engine replies with a list of sites asking the same question, together with a note that it had found about 2,110,000,000 other results. Ponder that number for a moment, for it reflects the scale of the information explosion that was triggered by Tim Berners-Lee’s invention of the web in 1989-90. Back then there were no search engines because there was no need for them: there were very few websites in those early days. Google turned 20 recently and the anniversary prompted a small wave of reflections by those who (like this columnist) remember a world BG (before Google), when information was much harder to find. The nicest one I found was a blog post by Ralph Leighton, who was a friend of Richard Feynman, the late, great theoretical physicist. Early one Sunday morning a month ago, a German carpenter was fatally stabbed in a street fight in Chemnitz in eastern Germany. Little is known about how the brawl started, but rumours rapidly circulated online that the man was defending a woman from sexual assault. Within hours of his death, rumours that his killers were two refugees triggered a violent reaction. For two nights running, thousands of rightwing extremists and sympathisers took to the streets of the city. Shocking videos of demonstrators openly using the Nazi salute (a criminal offence in Germany) and chasing and attacking people of foreign appearance rapidly appeared online. The reverberations of the riots continue to roil German politics and society. They appear to have given a massive boost to the right-wing AfD party, for example, which according to some opinion polls is now in second place in Germany. And last week, Angela Merkel removed the head of the domestic intelligence agency, Hans-Georg Maaßen, from his post after he faced criticism for his reaction to anti-immigrant protests in the city of Chemnitz. He had cast doubt on the authenticity of the videos showing dark-skinned people being chased and attacked. What’s going on? How did many Germans become so worked up about a street brawl?